Today's session was focused on finding shared purpose, Then, once you have found it, how you go about achieving it, using the most emergent improvement and implementation science approaches: including interdependency, scaling up and scaling down and the importance of theories of change. Large scale change is about a shift in mindset towards shared purpose with the people who are part of the improvement effort. Workshops like today, with 150+ change agents/transformation leads are so important because people are on a journey in developing a large scale change mindset and the skills that go with it. Few come by it naturally and even fewer are trained or have the experience with the level of transformative change this conversation speaks about. Taking the time to discuss and further develop these skills is critical. The workshop was convened for that reason, to bring people together so that they can continuously grow their ability to be in service of large-scale change. Today's session was convened by Karen Bloomfield of the East of England NHS Leadership Academy. Karen really gets the importance of bringing change leaders together. It's an act of bravery to acknowledge that you cannot do radical transformation and change in the same way we do regular work. Radical transformation requires sharing and learning together as a pre-requisite. It was a privilege for me to see Karen’s act of leadership in brining this group together in this way. I love being with people who want to realize the potential of integrated care and who come with an open mind and heart to contribute and learn. I saw this from each person at the NHS Leadership Academy today. I genuinely did see this in each person. People worked hard together to work the 'mindset muscle' to facilitate large scale change. - OUR (Who are the people that will be impacted by the change? Who will need to be part of the change) SHARED (What unites us) PURPOSE (Why are we taking action? How does it connect with the things that really matter to us?). Don't confuse shared purpose with an AIM. 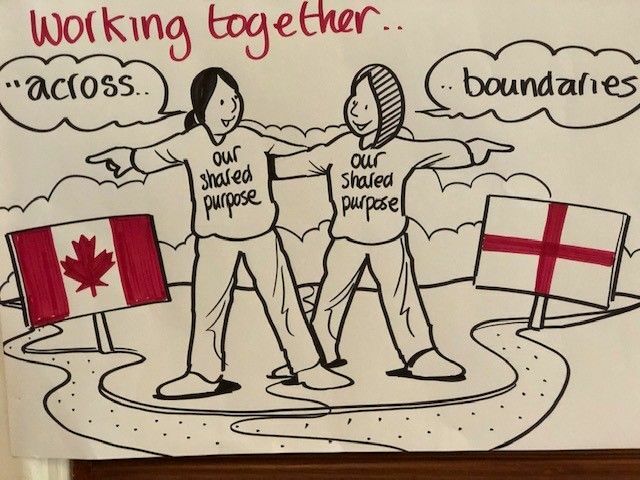 - We need to move from independent quality improvement initiatives (within a clear boundary) to inter-dependent quality improvement (collaborative, built on shared purpose, multiple methods). - We need to both scale up and scale down. Personalized care (what matters to me) for each person AND at a scale that impacts hundreds of thousands of people. - Theories of change are important because they help describe what success looks like and how to get there. The Change Foundation team has developed a theory of change that serves as a guide for how our multiple change efforts are interdependent and together demonstrate our intention for improvement at both the system and individual level. I was excited to tell The Change Foundation story today, for people to get to know us and to share our theory of change. In addition to the process people went through to build their 'transformative change muscles', people walked away completing their partnerships templates which they will be using to guide their approach to their work with the ICS's and STP's. People spent time meticulously rolling up and packaging their completed work as they knew it would serve as a guide to them for how they will move forward next. Talk about delivering value for everyone who attended. Follow the tweet discussion at #eoefuturelead. A special thank you for having me play such an active role today, facilitating, listening, contributing and presenting. I felt right at home. Thank you for the sketch note, I love it. I have it folded perfectly to bring home to Ontario, Canada to frame. Today reminded me of how proud I am to be part of the global movement on integrated care and large-scale radical change focused on what's most important to people and their families and to spend time with others who have the same shared passions. A special shout out to my close colleagues at the International Foundation for Integrated Care (IFIC), with whom I also collaborate, along with the 60 countries they have brought together to accelerate the learning and adoption of integrated care around the world. After my few weeks with Helen and the Horizons team, I will be heading to IFIC's international conference where 1200 people from 60 countries will come to connect and learn from each other. I plan to build my learnings from this time into my presentations. I'm looking forward to sharing … for those who aren't attending the conference, live webinars have been enabled so please join and the link above. I am off to the global conference for Ambulance Services joined by Ian Baines of the NHS Horizons team. I'm looking forward to another great day.